I’ve been grumpy this week. The husband is working too much. The weather has been meh. The 16-year-old complained that our town is too white – and I don’t disagree. She worries that perfectly nice people grow up to be racists simply because they aren’t familiar with people of other colors, especially black people. Including herself. She’s worried about herself. Made me really miss NYC. Even if you live in a bubble in NYC, you encounter people of other colors and classes as you move around the city. A couple months ago, on the WTF Podcast, Marc Maron interviewed a comedian called Ms Pat (Episode 540). This interview was really great. Really great. Ms Pat comes from inner city Atlanta. She's black, and grew up poor, and she was pregnant at 13. And she has gotten out and moved to a northern city and to a mostly white suburb. She explains her upbringing and the attitudes of the disenfranchised poor in the ghetto. She makes it funny, and therefore palatable. There’s intentional wall-building on the part of the inner city folk. A sense of f-you if you won’t help me out and make room and recognize my humanity, then I don’t want any part of yours. Thus the intentional crude and unschooled attitude, the anti-"bougie" stance. It’s self-defeating by being so repellent. On the other hand, it’s understandable. Anyway, Ms.Pat. If you're not likely to visit the WTF Podcast, or you find Marc Maron crass and tiresome, which he can be, here’s a sample on YouTube of Ms Pat. I want some of that mushroom juice. Because this phrase in particular, “guilty about growing older,” struck me. Guilt. Or shame. About a less than perfect, youthful body. I relate. As if it’s somehow shameful to grow older. As if it reflects badly on one to show signs of age. I relate to that, and I reject it. I must, right? I mean. Okay, am I rejecting it? Because, Readers, I did highlight my hair. And I use face cream. And other cosmetics. And, ironically, just at the point in my life when I’m losing it, I feel very appreciative of my waist and want to highlight it in my fashion ensembles. In fact, just at this point in my life I’ve suddenly started paying close attention to what I wear. That’s not exactly rejecting the shame of decaying in public. Which is why I'm considering trying some psychotropic mushrooms. Never tried 'em. Like our society. The good news is I’m in sync with the times. I have company. Along with our commitment to human welfare, civil rights, and the “Pursuit of happiness,” I’m decaying in public. I told you I'm grumpy. Okay, here’s a cute thing. This boot. This arrived in the mail the other day with a note saying, “No we haven’t got the wrong size; we’re just letting you know we have your order and we’re working hard on getting it to you.” This because I ordered a pair of LL Bean boots, you know those basic duck boots, those boots I hated when I first became aware of them back in 1978. Anyway, I ordered a pair of the old standby (with Gortex and Thinsulate), and they were backordered. Backordered until the end of February. Hello? End of February my, uh, foot. That will be practically spring. Oh, sure, up here in the Northeast, we might be a few blizzards shy of actual spring, but we will definitely be at least 4/5 of the way through winter. This isn’t a problem for me, actually. I still have my L.L.Bean boots. They are about 25 years old and going strong. No, these are for the 16 year-old. Said I, when I discovered this backorder business, “Hmmm. If my 16-year-old wants L.L.Bean boots, then they must be having a popularity surge.” And sure enough, I learned, when I went for lunch with a well-informed friend (a librarian, of course), that L.L.Bean has experienced such a run on their boots that they are making more machines to make more boots to meet demand. Apparently this is because of the Normcore trend among college students and young adults. Normcoreis all about “intentional blandness." Once again, I guess, it's hip to be square. So let’s just get one thing straight. Apparently these boots, which I loathed as representing Preppy back in my teen years; these boots, which I caved to and bought in my twenties because they are the best boots for cold, slushy snow (I lived in Boston); these boots now appeal to my style-conscious teen. The one who wears flannel ironically, with a miniskirt. And Dr. Martens combat boots. You know, when I was – how shall I phrase this? Young – too general? Twenty-something-overused? 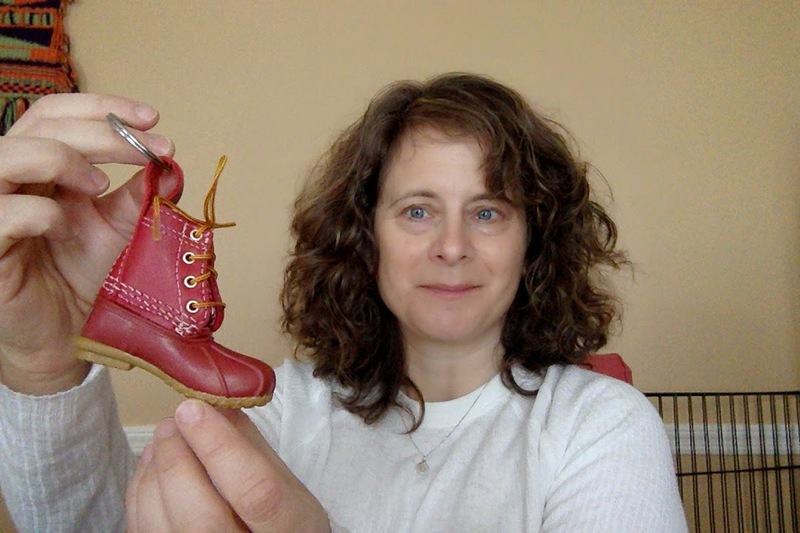 In extended adolescence – yes, that’s it – when I was in extended adolescence, the person who wore Dr. Martens combat boots was not the same person who wore L.L.Bean boots. Just saying. That flannel she wears, by the way? Mine. Vintage. From L.L.Bean. Although, come to think of it, I bought it during the Grunge Phase in the late Eighties, and I wore it with Dr. Martens (shoes, not boots). So what is my point? I don't have one. Oh dear! just wrote a long reply to thisand it got erased. Anyway, just said that I can relate to it all! My daughter wanted the same boots, loves vintage flannel shopping, would wear my old Docs if only they were boots, I'm about to turn 50, blah blah blah! Anyway, nice post! So funny, isn't it? Happy almost-birthday!